When times are hard, there’s no cinematic escape to lift you quite as high as the old standbys of “love” and “dancing,” and such is the case with this old-fashioned, non-challenging, cinematic slice of comfort food—the aptly named Love N' Dancing. And far more fittingly-- in case moms were feeling left out from the summer box office that puts an emphasis on fare for teenage boys-- this adorable if admittedly predictable charmer opens just in time for Mother’s Day-- for the seven or eight of you who won’t be trying to “beam up” for Star Trek. Intriguingly, the film’s roots began several years ago when the actor and comedian Tom Malloy became inspired to pen the script while taking in his first professional dance competition. So while the idea to make a dance movie long before they were again in vogue with the advent of So You Think You Can Dance and Dancing With the Stars on network television seemed odd half a decade ago, today it feels like it’s exactly the right time for Love N' Dancing to land in theatres. 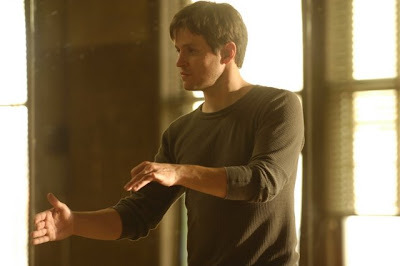 Although as Royston continues, dance movies are very different than musicals--now more than ever we’re seeking out something that as he explains, “makes people feel good, and… gives them something to do that isn’t expensive or complicated,” and Love N' Dancing is guilty on all counts. An affable trifle you can predict the entire way through before the end of the opening act—its uncomplicated familiarity nonetheless takes a backseat to the feeling it evokes in its celebration of West Coast Swing dancing, romance and the tried and true plot of a woman engaged to the wrong man who finds the right one and her true self when she sets foot in a dance studio. Luckily the grace and enthusiasm of Amy Smart elevates her standard chick-lit character from its one-dimensionality of the page that downright shines when she’s challenged by the slithering, all business, sans romantic maneuvering of her fiancé Billy Zane (playing the type of self-involved jerk he does best). And although it’s unfortunately hindered by the otherwise tremendously talented dancer and screenwriter Tom Malloy’s weak acting presence as the romantic lead and third part of the love triangle opposite Smart and Zane, he manages to write his way out of what could’ve been a mess by inserting a clever twist into the old formula by making his professional dancer turned instructor deaf. Unwilling to compete anymore since he’s convinced that his prior back-to-back championship titles may have been awarded based on sympathy rather than merit, Jake gets by as a public school motivational speaker by day and dance teacher by night. And in doing so, he meets Smart’s buttoned up, bespectacled and cardigan clad middle school instructor Jessica in the daylight and then arranges to instruct she and her fiancé in the art of dance in evening sessions to ready them for their nuptials. However, when Zane’s BlackBerry, Bluetooth headset, and business wheeling and dealing out-rank his affection for Jessica as he repeatedly ditches her to take classes alone, soon Smart’s Jessica begins to recall the budding dancer she’d been as a young woman as she realizes that both Jake’s encouragement and West Coast Swing becomes her. Still hung up on his old professional partner (Royston’s real life wife—the actress and dancer Nicola Royston) who tries to lure Jack back to competing with none-too-subtle flirtation--soon he begins imagining what it would be like to return back to the ballroom but this time, with Jessica on his arm. While it doesn’t take a chemist to figure out exactly where this formula is heading—the movie’s stellar production values (that hide its twenty-eight day shoot and substitution of Albuquerque for Philadelphia) with top-notch cinematography, editing, soundtrack, and direction from She’s All That helmer Robert Iscove ensures it never overstays its welcome thanks largely in part to the plethora of professional dancers who comprise the work. Utilizing West Coast Swing for the very reasons that “it’s not only visually exciting, but it’s the kind of dancing that works well with almost any type of music,” as Royston continues—the film’s authenticity in the style reigns supreme since in the labor of love work, “there are 18 world and national championship title holders represented." Likewise, it’s always thrilling to know that what you’re watching is the genuine article and not just Flashdance style movie trickery. While a few of the film’s subplots including an underwritten Caroline Rhea whom appears merely as a foil to converse with Smart (often in the middle school bathroom) and a lesbian dance instructor who fills in as a gender-bender twist on the “gay best friend” character for our leading man feel a bit half-baked, it’s always fun to see Zane work it as the smarmy modern day cousin to the character he played in James Cameron’s Titanic. Amusing, frothy, and light as air-- Love N' Dancing doesn’t have any pretenses in trying to be a box office CGI smash. However, it does succeed for its built in audience of dance enthusiasts (especially the growing fan base in the dawn of Dancing With the Stars) and those of us who--tired at the end of a long hard day of an even longer and harder week--just want to go watch some Love N' Dancing. Even though in Iscove’s movie it works to the film’s advantage if you’re hoping to see the two qualities in reverse order as the dancing far surpasses the love which in my filmgoer’s eye, works just fine as that's entertainment indeed.